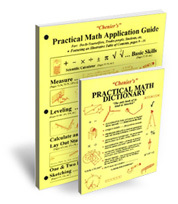 Chenier's Math | Applied Math that Makes Sense! feel unable to connect the dots, or remember applied math? when they are applicable and can relate to us. you can take a common sense approach to applied math skills. From the classroom to the construction zone, you'll find helpful diagrams and instructions for applying math in everything! Helpful diagrams - no more vague formulas! Hands-on projects that simulate industry used concepts! 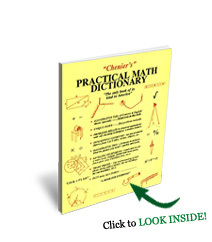 From basic scientific calculator skills, to Trigonometry, Chenier's Practical Math Application Guide gives you real-world examples, and how to really use math! 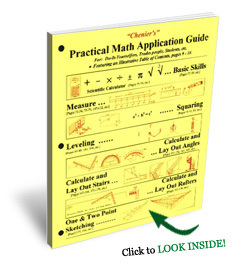 The Perfect Applied Math Reference guide!